Sponsoring proms is a great way to promote your business to thousands of local people and visitors. Sponsors can benefit from their logos displayed on posters, leaflets and in the glossy programme, and their names in news stories and on websites. As a sponsor you also have prime seats at the event, right in front of the stage. We also have opportunities to buy advertising space in our proms programme. Packages range from £250 and up. 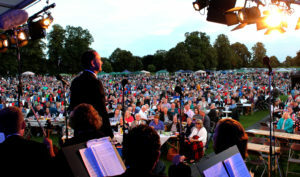 If you are interested in sponsoring 2019’s event, please contact the proms team by emailing proms@lichfielddc.gov.uk or by calling 01543 308866. Download our Sponsor Lichfield Proms leaflet.